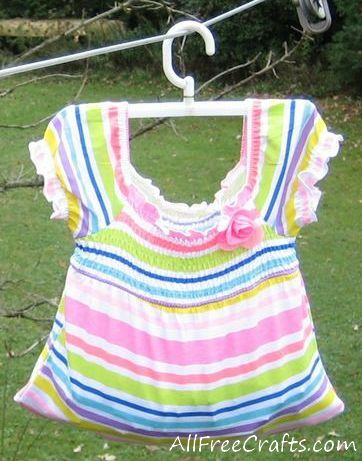 Turn a child’s summer dress into a pretty peg bag with just one seam. My last Tea Towel Peg Bag lasted me ten years, so I’m not complaining. That’s an awful lot of hanging on the line, baking in the hot southern Ontario sun and swinging in the breeze. But the ends of the hanger had finally worked through the fabric and the pattern was beyond faded. Time for a new peg bag. I thought about buying one. Picked up a cheap version at the dollar store and promptly put it back on the rack. The fabric was so thin it wouldn’t have lasted ten weeks let alone ten years and the hand hole was too small. Then I saw this pretty little girl’s dress at the thrift store, with a wide elastic neck and short sleeves. It also came with its own hanger. Perfect. I brought the dress home, changed the black thread on my sewing machine to white, turned the dress inside out, pinned the bottom hems together and sewed across them. Done. That’s all you need to do really. Off topic, but a pet peeve of mine: why is it, whenever you want to do a quick sewing job, the thread already on the machine is always entirely the wrong color? Peg bag dress filled with pegs and ready to use. Essentially, do what I described above – turn the dress inside out and line up the front and back hems nice and straight. Put in a few pins to secure the line. Sew a straight line along the bottom of the dress. My dress hems were about one inch deep, so I just sewed along about 1-1/8 inches away from the bottom, or just beyond the folded hem line. Don’t forget to do a few reverse stitches at the beginning and the end of the row to prevent the tread from unravelling. Sew another seam line in the same way, about 1/8 inch beyond the first one, to reinforce the bottom of the peg bag where you need the most strength. Snip threads and turn the dress right side out. 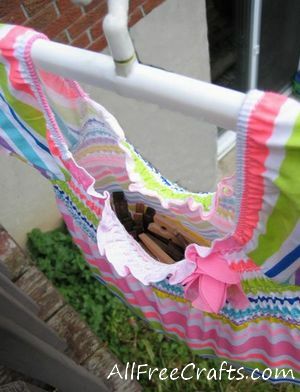 Place the dress on its hanger and fill with clothes pegs. Go ahead and hang out your freshly washed clothes. I place my peg bag on the line and dip into it for pegs for each item that I’m hanging out. When each piece is secured, I just push the peg bag further down the clothes line, making room for the next towel or pair of jeans. If you’ve never used a peg bag, you’ll love it. No more stooping for pegs on the ground umpteen times each load. Tip: If you find the dress slipping off its hanger as clothes tend to do at times, put a few hand stitches in the dress directly under each end of the hanger. Or try sewing the ends of the dress sleeves together to reduce the slipping.